Commonly known as the Dutchman's Pipe, Aristolochia cathcartii is undoubtedly the most exotic of all the species within the Aristolochia family. 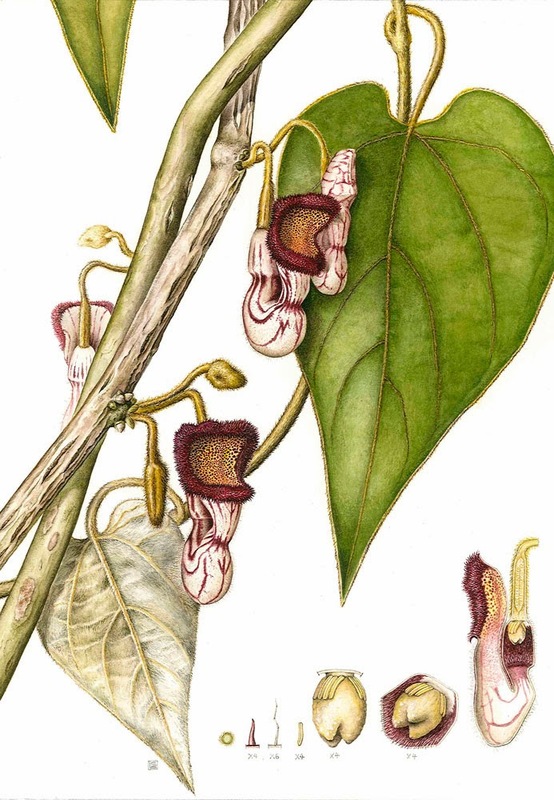 Native to the eastern Himalayas and reaching as far as southern China, this large woody climber can be found in dense, subtropical forests at an altitude of approximately 400–1000 meters above sea level. It has a corky furrowed bark and its 4.5 cm long flowers, which are produced from April until June, have a distinctive 'S' shape. They are in effect cream-coloured tubes, strongly inflated with striking purple venation. The tube mouth is much broader than the tube and has yellow and purple dots inside The mouth is also fringed with succulent purple hairs. There is good reason behind the conspicuous shape and bright purple patterning of the flowers. This because they are intended to both look and smell like rotting flesh, something they achieve with nauseating excellence. This mimicry has evolved in order to attract its insect pollinators. The membrane inside the top of the flower is extremely thin and allows light through. It acts like a tiny window and attracts pollinating insects which fly towards this creamy light. 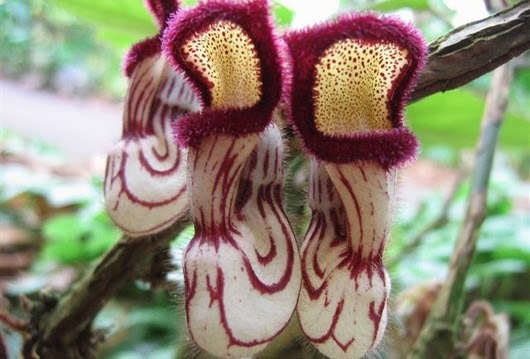 This area houses the sexual parts of the flower, and once inside the insect is imprisoned by specialist downward facing hairs. When the insect has been trapped for long enough it will become covered in pollen. The imprisoning hairs wither and the insect is free to go and pollinate another flower.